The Moluccan Cockatoo (Cacatua moluccensis) is Vulnerable in the wild, owing to unsustainable harvesting and habitat loss. Project progress: From 1990-2004 The World Parrot Trust supported the unique work of Project Bird Watch, which encourages the protection of key Moluccan Cockatoo habitat by sustainably harvesting Molucca nuts. Funds were also provided in 1995 for an expedition to Seram, and in 2001 to the nut project for processing equipment. 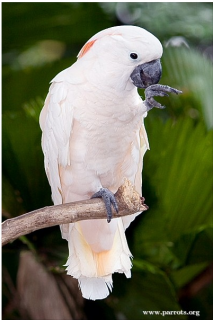 Outcomes: The Moluccan Cockatoo was placed on Appendix I and II of CITES by 1989, a measure which has reduced trade at the international level. Recently an awareness and education program was launched. Further work has determined that detailed research into the species' population dynamics, local movements and threats is needed. Wildlife trade monitoring and control is required through effective enforcement of legislation. Manusela National Park boundaries have apparently overlapped with logging concessions and this needs to be addressed. Creating a strict nature reserve in the Wae Fufa valley of north-east Seram has been determined to be a priority. Where found: Manusela National Park, Seram, and Hitu Peninusula, Ambon, Indonesia. Ecology: Moluccan Cockatoos favour forest and tall secondary growth in its native Manusela National Park. They are seen in pairs and small groups and are wary, but otherwise noisy and conspicuous. They are active early morning and late afternoon, keeping occupied through the day foraging for nuts, young coconut, seeds, berries and insects and their larvae.